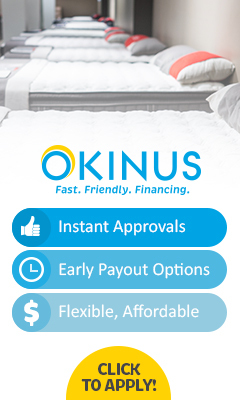 This application is owned and operated by Okinus Inc. All information entered in the application is kept safe and confidential. No interest or minimum deposits, monthly payments or storage charges. Put down any amount that's comfortable for you and make a monthly payment that's comfortable for you. When you're ready for your furniture we will have brand new merchandise from the factory ready for your home. We offer a variety of credit options with several financial institutions so we're confident we can get you financed.